A medically disabled Air Force veteran who was under the influence of depressants when she caused a multi-car crash in University City that killed a 77-year-old man in another car and seriously injured his wife was sentenced Monday to five years in state prison. 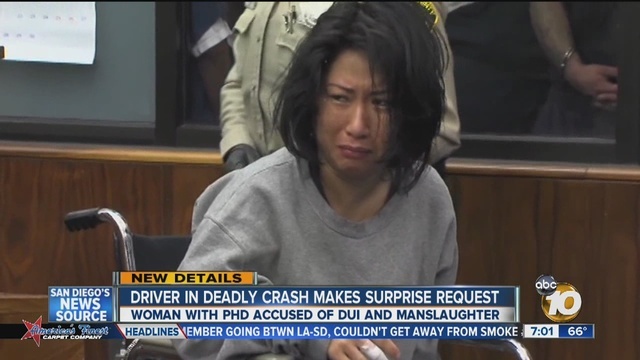 Soranon Booppanon, 40, pleaded guilty to gross vehicular manslaughter while intoxicated causing great bodily injury and DUI with drugs. Superior Court Judge Timothy Walsh rejected a defense request to place the defendant on probation and refer the case to Veterans Court, a program where military veterans can be monitored and get the help they need. Walsh said the defendant knew or should have known that the medications she took the night before the accident came with warnings about the dangers of operating a motor vehicle while on those medications. Despite her outstanding military service, Booppanon needed to be punished for the death of a person and causing serious injuries to others, the judge said. Deputy District Attorney Makenzie Harvey said Booppanon was under the influence of Valium and three other prescription medications about 10:30 a.m. on Oct. 23, 2013, when she ran a red light on westbound La Jolla Village Drive at Genesee Avenue and caused a chain-reaction crash that killed George Matteson of Pacific Beach. Matteson’s 74-year-old wife, Betty, suffered more than 10 broken bones. “This was not an accident,” the prosecutor told the judge. Defense attorney Cole Casey said Booppanon was medically discharged from the military after becoming ill and was diagnosed with post-traumatic stress disorder. He said doctors at the Veterans Administration treated her with too many prescription medications. Booppanon was ordered to report for custody May 4.